Why do we need to "up" our body's endogenous antioxidants? 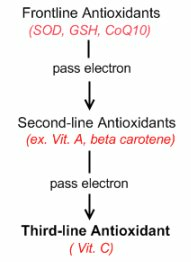 Endogenous antioxidants are the body's own line of defenses against free radicals. "Endogenous", according to Merriam-Webster dictionary, means "produced or synthesized within the organism or system." Endogenous antioxidants therefore refer to antioxidants that are produced inside our body. Our body's frontline antioxidant system is composed of superoxide dismutase (SOD), glutathione, Co-enzyme Q10 (Co Q10), alpha lipoic acid and catalase. The most important of these frontline antioxidants, however, are SOD, glutathione and Co Q10. These molecules are present in the body in parts of a million. These three antixodants act by absorbing an electron from a free radical. In order to reactivate themselves, they pass that electron to the second-line antioxidants such as Vitamins A and beta carotene. These antioxidants are present in parts per thousand. These second-line antioxidants then pass that electron to the third and final repository of electrons, which is Vitamin C. Vitamin C is present in higher concentrations in the body. You can see why Vitamin C is a very important antioxidant. It is not synthesized by the body. So, we must take it from our diet. And as you can see, we all need a variety of antioxidants, not just one class or type. But the problem is, too much emphasis has been placed on "outside" antioxidants such as Vit. C that our body's frontline defenders are overlooked. What makes glutathione stand out from other endogenous antioxidants?" Coenzyme Q10 or CoQ10 levels in the body, just like glutathione's, also decrease with age. However, it is not clear that replacing levels of Co Q10 is beneficial. It has been used, recommended and studied for numerous health conditions especially in the heart. But it remains controversial as treatment. Glutathione, however, has been studied and researched by many doctors and scientists. In fact, over 79,000 medical articles have been published about it. This is why glutathione supplements are slowly flooding the market. Alpha Lipoic Acid or ALA is called a universal antioxidant because it is both fat and water-soluble. This means it can enter all parts of the cell and therefore transport its antioxidant ptoperty at every part of the cell. This property is important especially in the brain because ALA is only one of the few substances that can cross the blood/brain barrier. It can enter the brain and go directly to where it's needed. Wow! Furthermore, ALA supplementation has been found to increase glutathione levels. This is why glutathione supplements almost always have ALA as one of its components. In addition, ALA helps the body recycle other antioxidants such as vitamins C and E, glutathione, and Co Q10. Superoxide Dismutase or SOD is an enzyme found in all living cells. In humans, it is the most important super oxide (O2-) scavenger in muscles. This is why deficiency of this molecule can lead to muscle pain and for patients to tire easily. SOD is dependent on the metals copper, manganese and zinc. Zinc and copper SOD are found inside and outside the cells. Manganese SOD, on the other hand,is found in the cell mitochondria. There is not enough evidence that oral SOD supplements are absorbed by the body. Sublingual SOD also have no substantial literature to support it. Only injectable forms of SOD that are used in clinical trials appear to be safe. "Myhill, Sarah. "Diagnosing and Treating Chronic Fatigue Syndrome" E-book. September 2009. Sept. 30, 2009.